The Outdoor Sofa from the Raffles Teak Outdoor Furniture Collection is a quintessential Mission style piece that has a commanding presence in the right setting. The real beauty of this outdoor sofa is that it doesn’t always have to be the center of attention though. The chunky legs and stout stance denote that the wood sourced to make this piece is uncommon. It is that wood that makes this piece so interesting. The pieces of teak wood are over 4.5 inches square when they start being shaped. 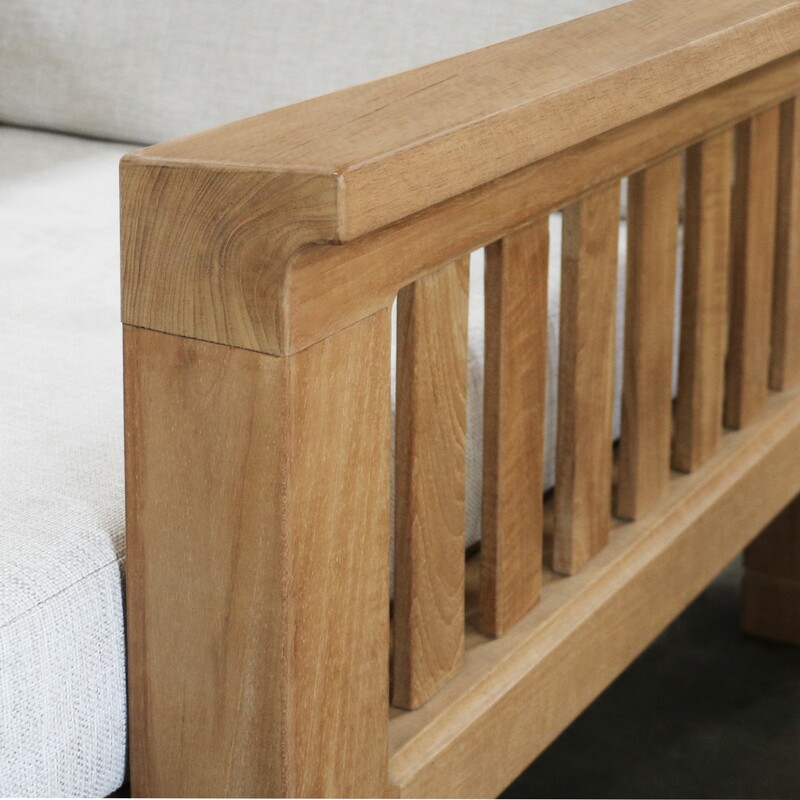 Such wood is in high demand because there is such a relatively small supply of timber that can accommodate those dimensions. 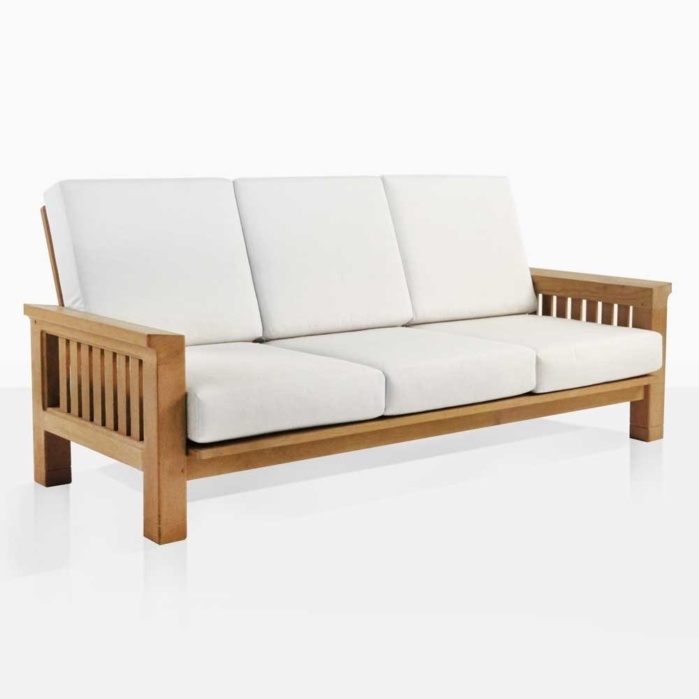 W87" x D36" x H38"
That is one of the main reasons you can feel such a proud sense of presence from the pieces in the Raffles Teak Collection; especially this substantial 3 seater (teak outdoor sofa). The pieces in this collection are very similar and the style is made to be simplistic but impactful. 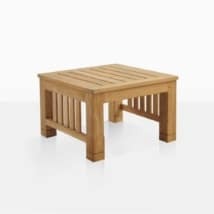 You do feel that sense of security within your garden that comes with these substantial pieces of cozy furniture. The pieces assimilate so well into a variety of settings and that considerable sense of presence comes along with the pieces whether they are in a dainty English garden or a drought tolerant desert-scape. 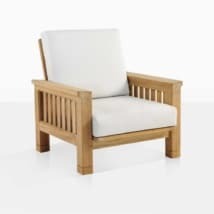 The classic framework support comfortable cushions made with Sunbrella® fabric. 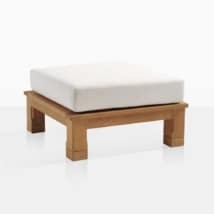 These 6-inch thick cushions come included with the price as shown. The seating surface is enough for 3 people with an ample 78 inches of width on the seating surface. 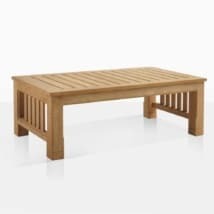 Seating depth for this outdoor sofa is 24 inches from face of seating cushion to face of back support. 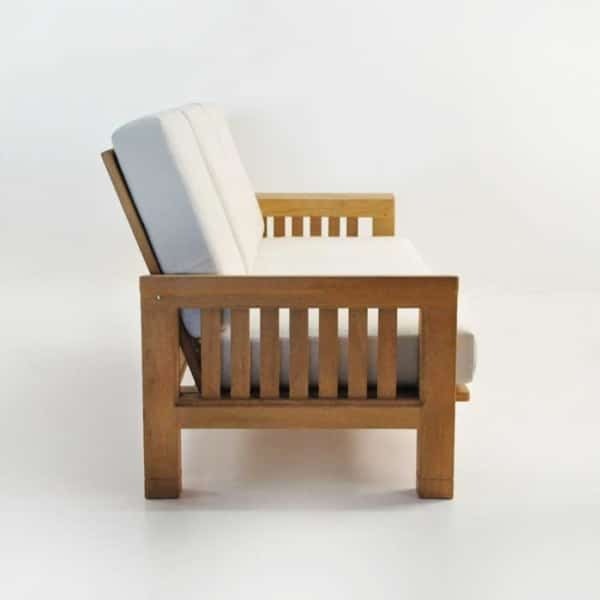 The tailored edges of the immense pieces of teak on the legs and arms of the Raffles teak outdoor sofa show the attention to detail and soft side of this memorable piece. 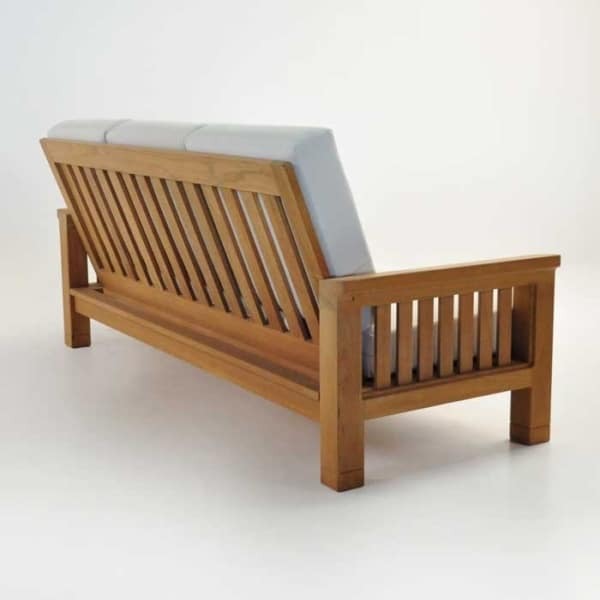 The comfort, combined with the build quality and the prominent teak make this piece an instant classic. 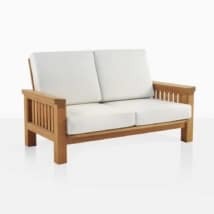 If you are looking for a plantation style sofa to place in your favorite outdoor area you’d be right on target with the mission inspired Raffles Outdoor Sofa.